Designed for boats with a LWL < 10 Meters. The SonicShield PLUS system has all of the benefits of the standard SonicShield with the added benefit of a fully functioning boat monitoring and intruder alarm. 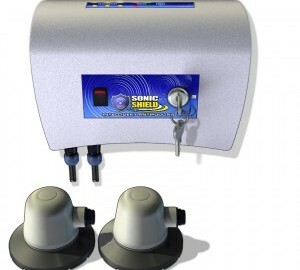 The SonicShield system is the most powerful available due to the patented technology that controls the power to the transducers. 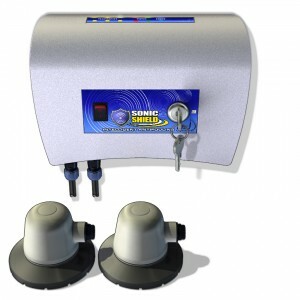 The SonicShield control unit will monitor the incoming power and will vary the output based on the power available. If a charging DC source is detected or if AC (Shore Power) is present the system will go into overdrive mode delivering up to 50% more power to the transducers. All of the PLUS boat monitoring items connect directly to the control unit using simply plug and play technology. This system is supplied with 2 transducers, the intelligent control unit, DC and AC power supply and all of the equipment required to install the system. Both transducers are located at the stern of the vessel one port and one starboard, the exact location will be dependent on your boat type. The SonicShield is the only system in the UK to offer 2 dedicated transducers to provide maximum cleaning to your propellers and rudder. All of our cables are Marine Grade Silicon H05RN, Included in the package is one 8 meter transducer cable and one 6 meter cable. One 12v / 24v power cable and one 110-240v Power Supply Unit. A fully functioning alarm system with GSM (SMS) notification system. Any intrusion is detected by the supplied PIR and will sound the powerful 111dB siren to deter the intruder. Alongside the audible alarm an SMS message will be sent from your unit informing you the alarm has been activated. The GSM control unit will also allow 2 way communication between you and your unit and allows up to 5 users. The product is supported by our 2 Year Return to base Warranty.